shirts. Good looking and practical. sport because of their easy fitting comfort. soft nap both inside and outside for warmth. double to take up the strain across your back. the strain, are double stitched for strength. See "How to Measure" at right. mers buy them year after year for work and sports. 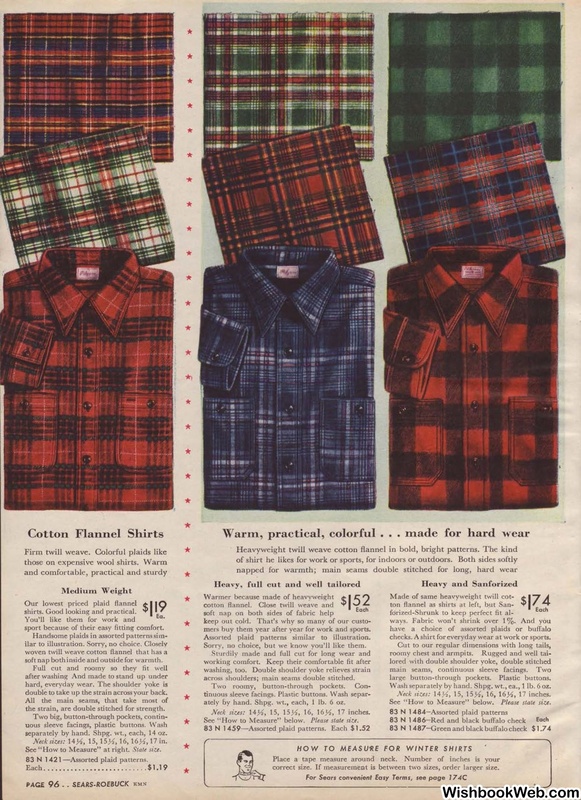 Assorted plaid patterns similar to illustration. across shoulders; main seams double stitched. ately by hand. Shpg. wt., each, 1 lb. 6 oz. See "How to Measure" below. checks. A shirt for everyday wear at work or sports. large button-through pockets. Plastic buttons. Wash separately by hand. Shpg. wt., ea., 1 lb. 6 oz.